The glorious Riesling grape is native to Germany's Rhein and Mosel River Valleys, it was here that this white grape gained its tenacious foothold in today's modern white wine market. A Riesling wine can span a broad range of styles, being produced in both dry to sweet variations as well as light to full-bodied. Riesling is one of the wine world's "new" sweethearts, enjoying double-digit market growth and culinary affections worldwide. Its food pairing versatility and refreshing palate appeal are among the top reasons for this renewed love affair. German Rieslings are categorized based on their style (levels of dryness) and the grape's ripeness level at harvest (i.e. Kabinett, Spatlese, Auslese, etc). When looking for a dry style of Riesling, the label's buzz words will be Trocken ("dry" in German) or Halbtrocken ("half-dry" in German, which translates to off-dry or semi-sweet on the palate). 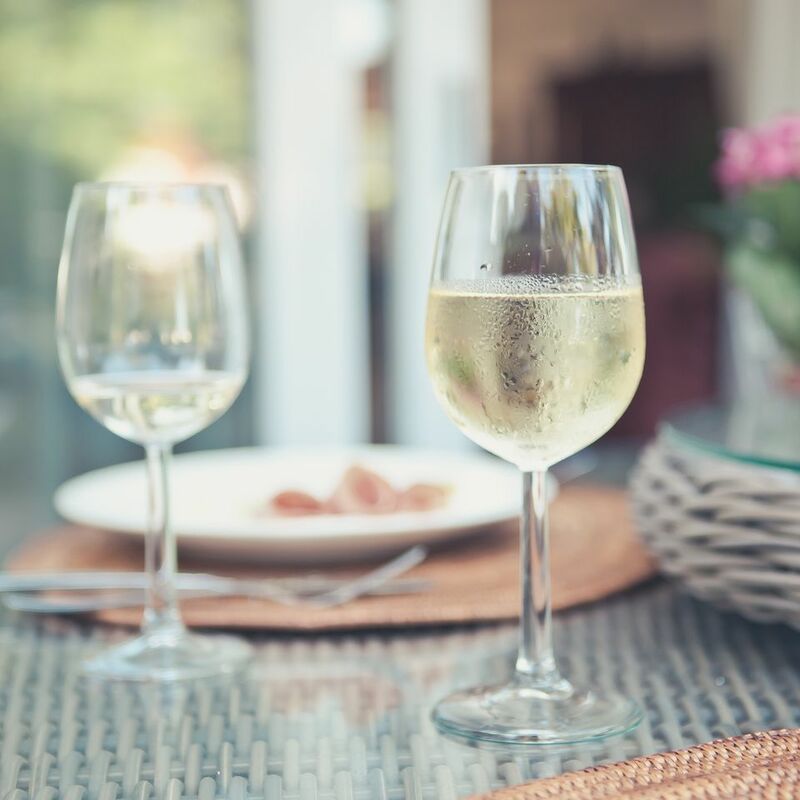 Riesling wines can be highly aromatic with apple, peach, and pear at the forefront mixed with delicate floral undertones and often honey and spice on the nose. On the palate, Rieslings echo the apple, pear, and peach along with citrus and tropical nuances. Rieslings tend to pick up a noticeable "minerality" from their native soils, explaining why hints of slate or limestone can be exhibited. Known for outstanding, floral and fruit aromatics, often with a characteristic "petrol" like scent, this wine cover a wide range of palate profiles, from crisp and dry to full-bodied, unctuous dessert wines - all brimming with food-friendly acidity. It's this innate acidity that allows many styles of Riesling to get away with outrageous levels of residual sugar without being cloying and syrupy sweet. When it comes to pairing Riesling with food, versatility is the name of the game. Rieslings may well be the most accommodating wine around for pairing with challenging flavors and spice profiles. From appetizers to desserts, pork, poultry or shellfish, and virtually anything in between the diversity of Riesling styles make them capable of handling just about anything you toss at them including the spice and zest of favored Asian, Mexican or even Moroccan foods. While historically associated most intimately with Germany, Rieslings versatility and relative receptivity to a range of growing conditions, including quite climates with a considerable chill, make it a natural choice for international plantings. Germany's Mosel, Rheingau, Rheinhessen and Pfalz regions are first stops on any Riesling tasting tour; however, bone-dry styles prevail in Alsace, France and Australia's Clare and Eden Valleys have come on quite strong with this particular grape. In the U.S. look for Washington and New York's Finger Lakes region as "must-try" options. Riesling wines have a unique Ripeness Classification System that will clue consumers in on whether to expect a light or medium-bodied wine as well as whether the wine will be dry or sweet.